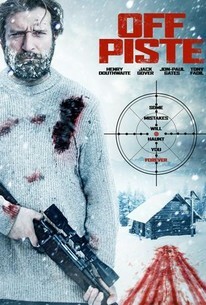 Looking at the cover of “Off Piste“, you’re expecting a pure survival movie full of action and chases in a French snowy landscape. That’s not the case. It’s rather a psychological drama in which processing a traumatic experience is the central theme. First we meet Stanley Winters (Henry Douthwaite) who during a military raid on a local pub, where I.R.A. members were discussing something, accidentally shot the young son of one of these members. And then there’s Niamh O’Brien (Lara Lemon) who witnessed the death of her younger brother and father that evening as a young girl. Both are struggling with the past. Stanley stows away his military combat uniform after this incident and moves to the French Alps where he’ll live with his blind mother (Yvonne O’Grady) in a remote mountain cabin. There he tries to find inner peace. As Niamh discovers the real truth about the death of her father and brother, she leaves Ireland confidently and travels to the French mountain village. The further progress of the story seems to be evident. You can only guess what motives Niamh has to find those responsible. Is it to avenge her loss? A revenge because her life ended up in a series of depressions? Or is it because she wants to deal with the past and finally be able to leave it all behind? That the person who took care of her afterwards still has a dossier lying around about Winters, is an indication about the unlikely and the sometimes nonsensical events. I liked the psychological aspect and thought it was interesting enough. Stanley struggling with his inner demons and using a female psychiatrist (who displays more uncertainties than her patient) to channel his recovery. Even Stanley’s mother tries to get her son back on the right path so that he rediscovers the meaning of life. That’s why she acts like a mother hen, the moment Niamh arrives. As a true matchmaker she tries to hook them up. She isn’t aware of the dreadful link that connects the two. What’s the flaw in this film you wonder? The absurdity of the two idiotic Irish guys, traveling headlong to the French Alps. Ethan (Jared Fortune) , because he believes that he sees himself as the fiancee of Niamh and he finds it hard to bear that she’s looking for another man. And then there’s Logan (Paul McGuinness). He’s just in it because he has probably nothing else to do. They arrive at the French village like two genuine Irish hooligans. Ethan confronts Niamh with the fact that she first had to consult with him. A bit later he clears off like a beaten dog after she made it perfectly clear to him what their relationship is about. The resulting response is so excessive that the credibility of the whole film is brought down. If these two skirts hunters have experienced many rejections in their homeland, I fear the female part of the population was decimated in number. I’ve always said that foam-free, warm beer is fatal for human brain cells. So despite the beautiful renditions of Henry Douthwaite and Yvonne O’Grady, “Off Piste” feels reasonably far-fetched. I understand that without the intervention of Etahn and Logan the complete movie would be kind of banal with just scenes of two traumatized souls. But as I said before, the motivation for their intervention is totally whacked. Even the ultimate action from Stanley is in terms of coincidence grossly exaggerated. Regrettable. Because eventually I found the underlying issue extremely interesting.